This script allows you to combine and remove troops from battle. You can add other troops to the current battle, or add individual enemies from other troops. 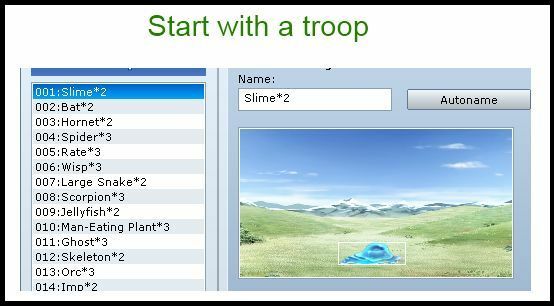 This allows you to create battles with many enemies, and you have full control over how they should be positioned by setting up the sprites in another troop. In a battle with multiple troops, you can also remove an entire troop from battle. 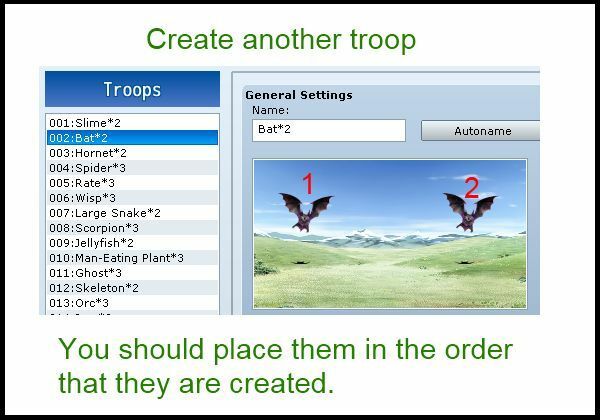 The purpose of this script is to allow you to set up your troops using the troop editor, and then add them to battles without having to worry about how to place them. We would like to add more enemies to this battle, so we set up the second troop. You will need to remember the “index” of each enemy, so it would be best to place them from left to right so. 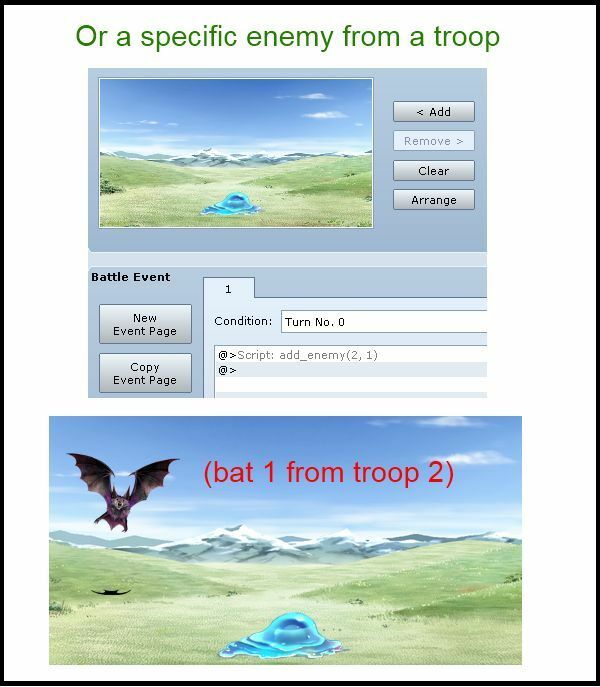 In this example, the bat on the left is “enemy 1” and the bat on the right is “enemy 2”, which is the order they were added. The simplest way to introduce more enemies is to add an entire troop to the battle. Sometimes, you might need to know whether enemies added from a different troop is in the current battle. Maybe the troop will keep re-appearing whenever the whole troop is defeated. Which returns true if there exists an enemy with the specified troop ID and is alive. Mh, with Enemy Reinforcement Events i have a bug. Okay, so I think I found another one of your scripts that has…issues…with Luna Engine. I’m going to do more tests to be sure. Also, I have the Enemy Events script, and the compatibility script. Script ‘Game_Interpreter’ line 1411: NoMethodError occured. It sounds like you’re using “Enemy Events”. Do you have the compatibility script installed? Are you using a script called “Enemy Events”? Because the add-on is only for that script. script = @list[@index].parameters + "\n"
The specific issue was bolded in this page, making it get the two stars on each corner. Where is this? I am not sure what you are referring to. Someone else got the same NoMethodError error I did. So I posted what’s on the Game_Interpreter area. Can I make monster use their skills at the same turn when I added them to battle? Thank you in advance. Unfortunately, when enemies are added to the battle, their actions are determined on the next turn (since the event runs after actions are selected). What you might do is to have the event run at the end of the turn, but it just changes when they appear. Hi there ! I’m afraid that your script is bugging with Yanfly’s Core & Battle Engine in the case of more than one enemy added : If in the first time enemies added die correctly, the next reinforcements will keep one of the enemy’s battler on the screen even after its death (for 2 enemies added), and directly from the first time for 3 and more enemies added. 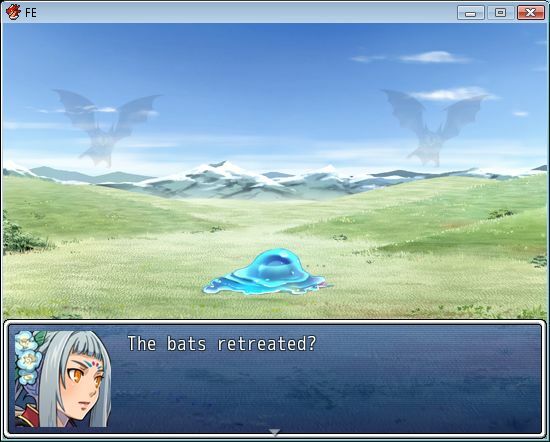 I think this issue may occur even without yanfly’s battle system. Let me check. I tried in a new project with and without Yanfy’s Core Engine, same for his Battle Engine and both of them, the problem seems to occur with any one of the two scripts. Of course, your script works correctly without Battle & Core Engine. Put together a new demo showing how to reproduce the issue (eg: start battle, attack enemy to kill it, next turn add two enemies, etc) and upload it somewhere so I can take a look. This will make it easier for me to debug the issue. I’ve updated enemy reinforcements to address the issue. Please update the script and it should work. Is there a way i can show summoning animation on the summoned monsters before they appear???? This script does not support showing an animation before a monster appears, but you could probably show an animation in your event before making the script calls for summoning more monsters. I’m trying to use this script with Cozziekuns’ Earthbound battle system script but I’ve been running into issues. I can add troops to the main battle and everything works fine, but when the added enemies die the game freezes (stops accepting input). It’s probably an issue with the Cozzie battle system core, but I can’t quite pin down what. I’ll experiment with script order and see what happens, but I don’t think it’ll help much. Anyway of making this hybrid with your Enemy Placeholder script? Like You have a Boss and 7 hidden enemies. Boss uses Summon spell that summons a random enemy <1,2,6,22> and the summoned enemy replaces one of the hidden placeholder enemies. And lets say when a summoned enemy dies it returns to being a hidden placeholder again. So the Boss can use that placeholder to summon to again. Probably an entire separate script itself but seems like you already have 2 of the 3 pieces of the puzzle already complete. Sounds like an interesting idea. If anybody could do it, its Hime! I add a troop at turn 5 and then every 4 turns. To check if there is an enemy from troop 7. Thank you Hime!! You’re awesome! Great Scripts! This may be related to how you solved your previous problem. Hey, great script. I noticed there might be a bug with Victor&apos;s Target Arrow. After an enemy has been summoned, the arrows are not shown with the proper enemy (mind you, this could easily be considered a bug with his script). I don&apos;t know how his script works, but you can set up a demo that shows the problem. Here&apos;s a demo containing the game. I can&apos;t see anything obvious why that might be happening. When I tried enemy reinforcements and the target arrows on a new project, it works fine even with reinforcements. You&apos;ll have to see if there&apos;s another script that&apos;s causing the problem. “Script “Game_Interpreter’ line 14111: ArgumentError occurred. Try it in a new project and see if it works. Then add each script one by one. I will also need to know what script calls are being made since the previous report did not specify anything. I’ve written an add-on to provide support for my Enemy Events script. 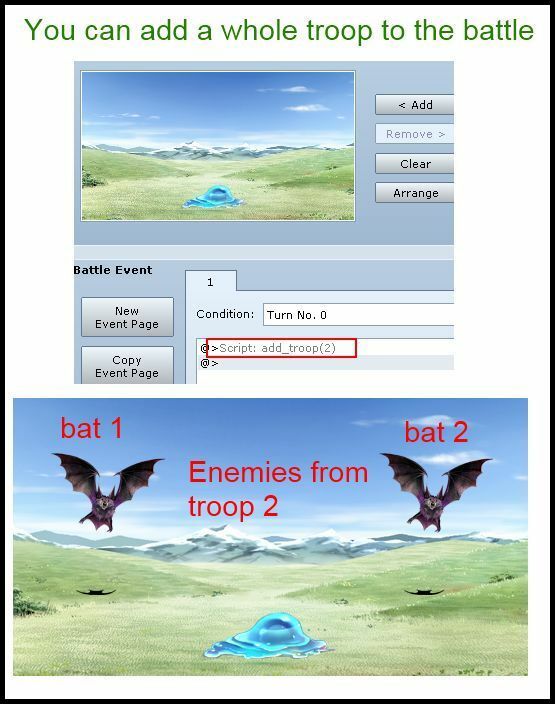 When enemies/troops are added or removed, their event pages are also added or removed. Hi, sorry but I’m new to RPG Maker vx Ace, and I am having a problem that I just do not understand. I download the script and put it into my script editor under Materials (Insert here). I noticed something that might be an issue and updated the script, but I don’t know if that solves your specific problem. Hello, I&apos;d really like to use these amazing scripts and I have same problem like HumanBLuE. In my case, arguments error happens when I tried to use enemy reinforcements script along with enemy reinforcement events (I also added enemy events script as you mentioned in the script). Enemy reinforcement script itself works when used alone. I&apos;ve updated the enemy reinforcements events add-on. It seems like I had updated enemy reinforcements without updating that one. See if the new change works. Thank you for quick update! Yet I still get a problem. When I use those scripts and it says me "undefined method &apos;can_add_event_pages?&apos;for#<Array:0x6c*****>". (***** are different everytime I try) Any ideas for this matter? Thank you for your kindness. I installed it under my Material tab in the Script Editor. Somehow the problem went away after my RPG Maker VX Ace crashed, thanks for trying to help anyway. You were probably doing a test battle but didn’t save the game before test battling. http://sadpanda.us/images/1734216-DJ7IJY0.png Since I can’t put it in text. I am not sure what the issue is. Try it in a new project. I am assuming you know how to add scripts to your project. Script ‘Game_Interpreter’ line 1411: NoMethodError occurred. I cannot reproduce the issue. How did you install the script? Script ‘Game_Interpreter’ line 1409: NoMethodError occurred. 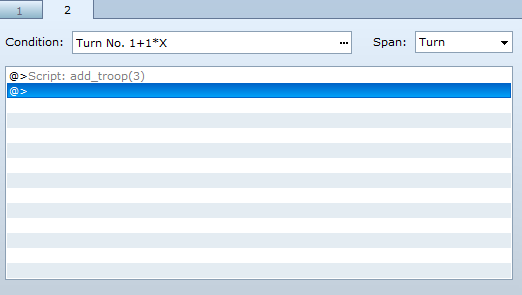 I don’t know, I just pasted in the reinforcements script and put add_troop(34) as the script for another troop. This does not work with ace animated battlers for some reason, do you have a way to fix this? I don’t know what that is. Can you post a link to the script? I’ve updated the script to support it.